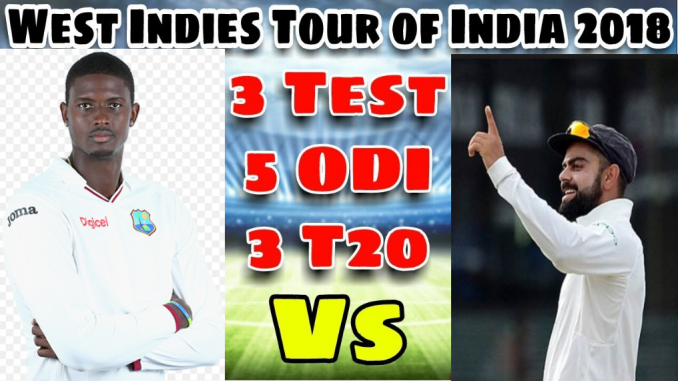 West Indies tour of India in 2018 has 2 Test matches, 5 ODIs and 3 T20Is. Check complete schedule and results. This is the twenty third series between them and Indians have won the last 6 test series. Check Indian Squad for test series with complete fixture and results of series. Records: Roston Chase and Holder have third 100+ partnerships for 7th wicket, new record in Test Cricket for any team. 10th consecutive series win at Home equals record held by Australia, who have achieved the feat twice in 2000 and 2008. 1st ODI, Guwahati, Oct 21 -2.00 p.m.
5th World Record ODI 200+ partnership between Rohit and Kohli. 2nd ODI, Indore, Oct 24 -2.00 p.m.
3rd ODI, Pune, Oct 27 -2.00 p.m.
4th ODI, Mumbai, Oct 29 -2.00 p.m.
5th ODI, Thiruvananthapuram, Nov 1 -2.00 p.m.
1st T20I, Kolkata, Nov 4 – 7.00 p.m.
2nd T20I, Lucknow, Nov 6 – 7.00 p.m.
3rd T20I, Chennai, Nov 11- 7.00 p.m.